Create an Excel spreadsheet to show your computations for the six ratios listed under each part. Create an Excel spreadsheet to show your computations for the six ratios listed under this part and also to include (copy and paste) the ratio calculations from the first two parts. In this part, you will calculate the last six ratios as well as comment on all of the ratios calculated so far, including the first twelve ratios calculated under the first two parts. Your comments for each ratio should include more than just a definition of the ratio. You should focus on interpreting each ratio number for each company and support your comments with the numbers found in the ratios. The summary and conclusion should discuss the liquidity, solvency and profitability of each company. Prepare a four-column worksheet in Excel, with the left-most column (column 1) to write the ratio names, the second column from the left (column 2) to show the calculation of each ratio for Oracle Corporation, the second column from the right (column 3) to show the calculation of each ratio for Microsoft Corporation, and the right-most column (column 4) to include your DETAILED comments about each ratio and what the ratio tells you about each company under study. Calculate each of the following six ratios. Earnings per Share Current Ratio, Gross Profit Rate, Profit Margin Ratio, Inventory Turnover Ratio, and Days in Inventory (Average Age of Inventory). 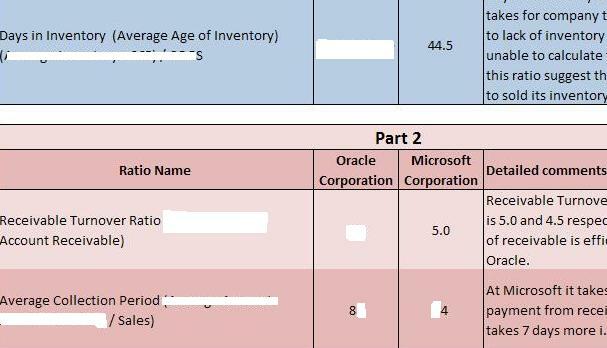 Prepare a four-column worksheet in Excel, column 1 to write the ratio names, column 2 to show the calculation of each ratio for Oracle Corporation, column 3 to show the calculation of each ratio for Microsoft Corporation, and column 4 to include your DETAILED comments about each ratio and what the ratio tells you about each company under study. Remember to copy and paste the ratio calculations and interpretations from the first two parts of the project in this worksheet, in addition to calculating the following six ratios. Payout ratio, Return on Common Stockholders’ Equity Ratio, Free Cash Flow Current, Cash Debt Coverage ratio, Cash Debt Coverage ratio, and Price/Earnings Ratio [For the purpose of this ratio, use the market price per share on June 1, 2007 for each company]. If you need any other type of help regarding Homework, Assignments, Projects, Case study, Essay writing then email us at [email protected]solvemyquestion.com We will get back to you very soon.